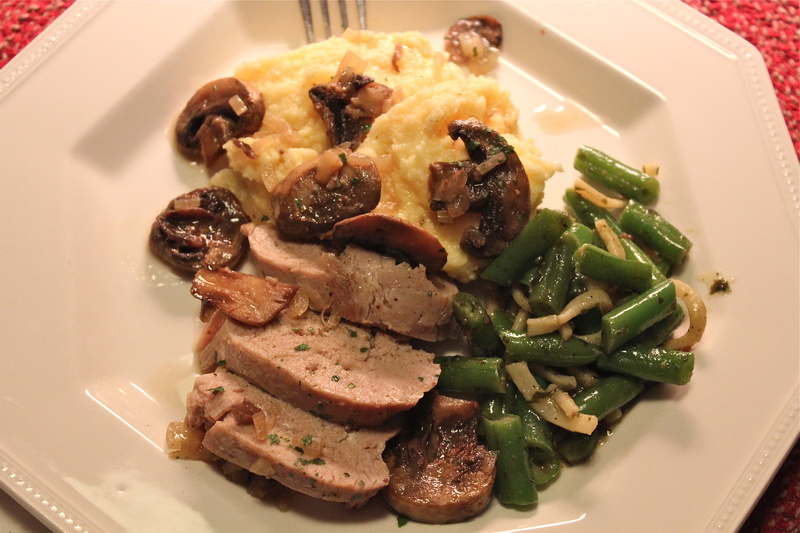 With a name like pork tender loin you would expect this cut of meat to be tender, right? I may be in the minority here, but I’ve had the experience where it wasn’t tender at all; more like dry, stringy, tough. Did I do something wrong that ruined it, or was it the cut of meat? 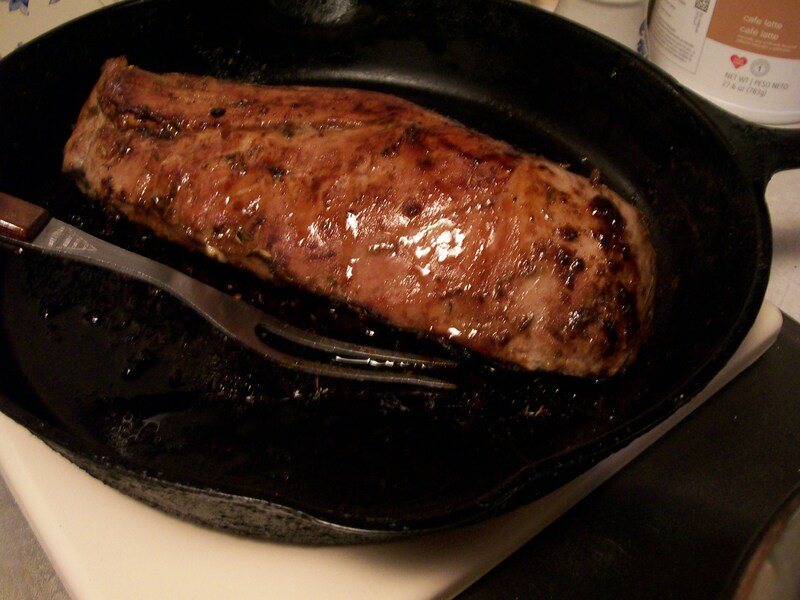 Most of the recipes I see for pork tenderloin have you cooking it (in the oven) at a very hot temperature, for a short time. This may be the method of choice, but it doesn’t give me the results I want. One thing I know about cooking most meats, is that the outside of it needs to be sealed in some way in order to contain its juices within. This is what makes a cut juicy. Without this step, cooking it at a high temperature will only dry it out, and that equals tough! 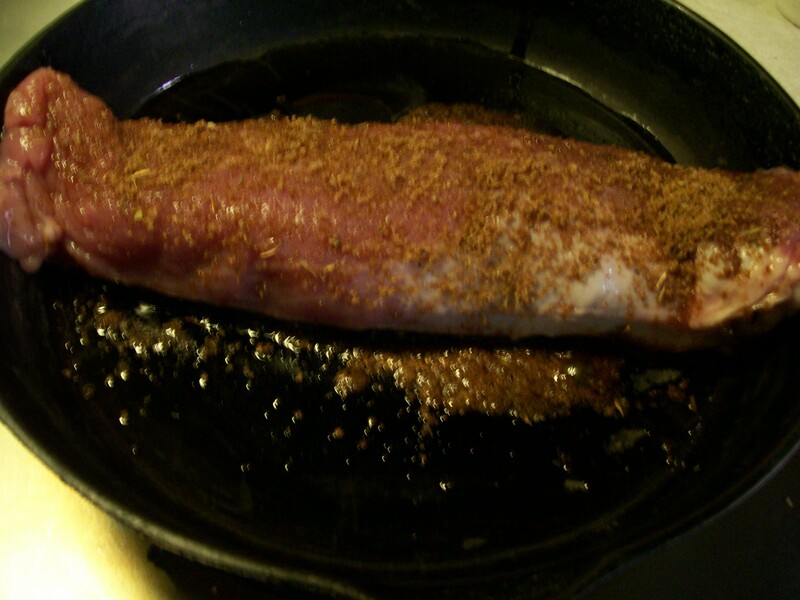 So, with that in mind, I experimented with a pork tenderloin that weighed about a pound. 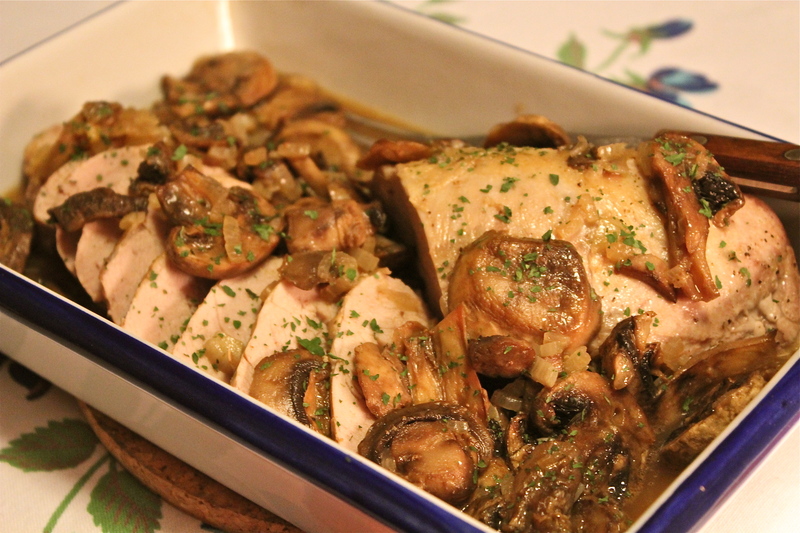 The recipe that follows describes what I did, and I’ll tell you right now that I got the results I wanted: a juicy, tender piece of meat with the added benefit of deep umami flavor thanks to the browning of the meat and the mushrooms used in the sauce. Served with a cheesy polenta to spoon the sauce over, this meal was outstanding. In the words of my husband, it was “plate-licking good”. 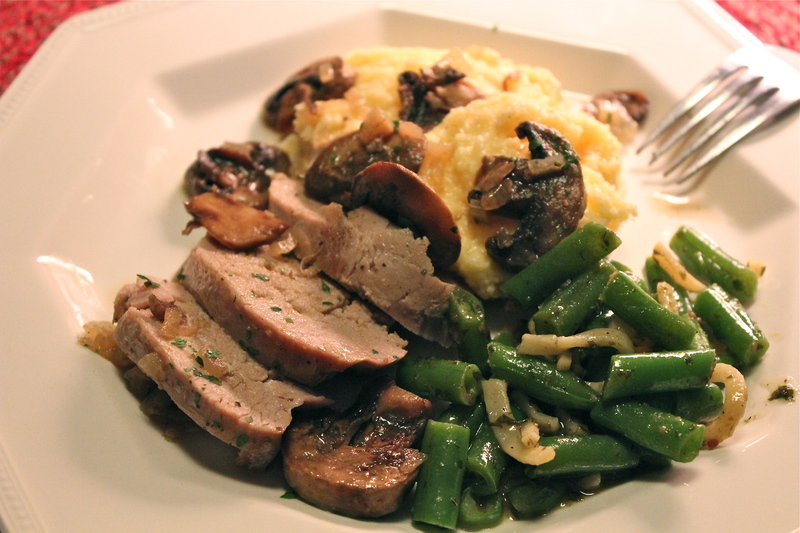 A moist cut of pork with mushroom sauce to spoon over polenta. 1. Preheat the oven to 375*F, and lightly spray a baking dish appropriately sized to the meat. 2. In a large skillet, heat 1 Tablespoon oil over medium heat. Season the meat all over with salt and pepper, and cook in the skillet, turning until browned, about 10 minutes. Do not skimp on this step, it’s what produces the sear to keep the juices inside. 3.Transfer meat to the prepared baking dish. Insert a meat thermometer into the thickest part of the meat. 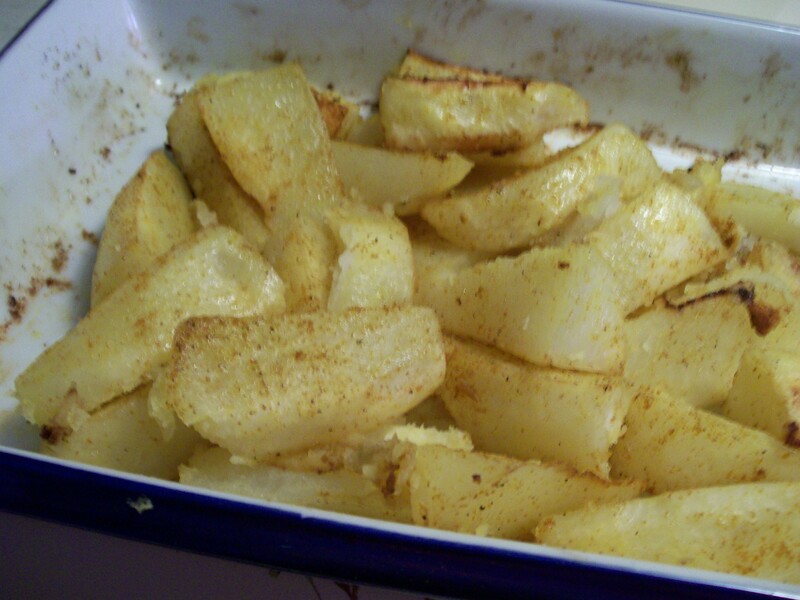 Put into the oven and roast until the temperature registers 145*—-about 12 – 15 minutes. When temperature has been reached, remove from the oven, cover with foil to keep warm and let rest while you continue. 4. In the skillet, add the remaining 2 Tablespoons oil, and over medium heat cook the shallots and mushrooms until softened, about 5 minutes. Add the chicken broth and simmer until reduced, about 3 minutes. Cover and remove from heat. 5. Meanwhile, in a saucepan, bring 3 1/4 cups water and the cream to a boil. Whisk in the polenta. Lower the heat to medium-low and cook, whisking, until thick, about 3 minutes. Remove from heat and stir in the cheese; season with salt and pepper. Cover and keep warm. 6. Transfer the pork to a cutting board and slice on an angle. Arrange on a serving dish, top with mushroom sauce and garnish with parsley. Serve with polenta. 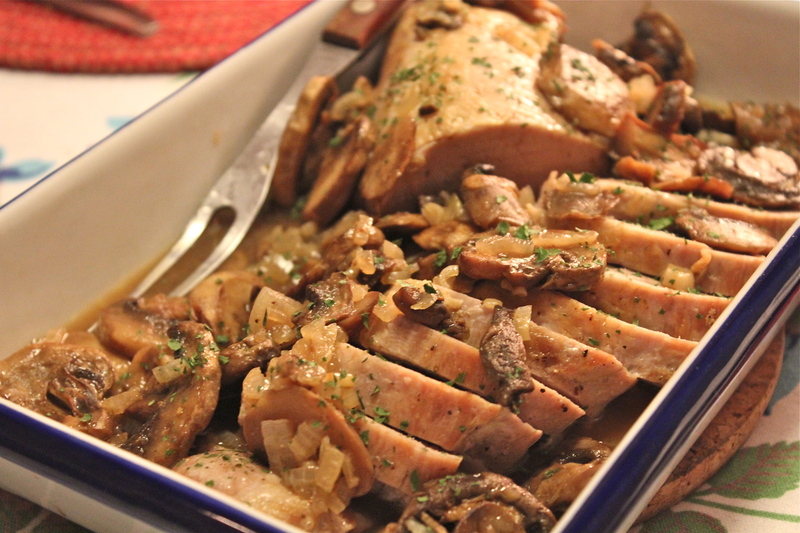 Slice pork, pour mushroom sauce over top. This meal can be completed by the addition of a green vegetable, such as green beans or broccoli. 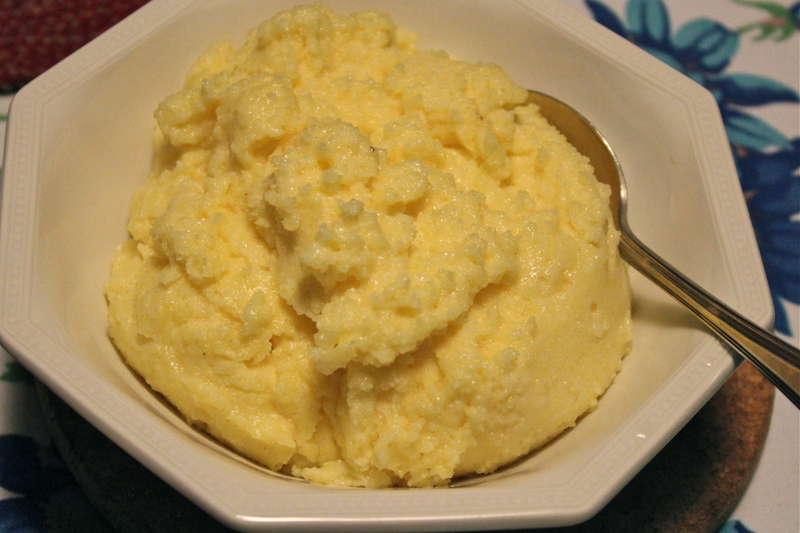 In the event polenta does not appeal to you, substitute mashed potatoes or rice to spoon the sauce over. It will be very good however you serve it.